Tamil Nadu Public Works Department (TN PWD) is serving the region for more than 150 years in the field of public works like engineering and construction of the state buildings, roads and other government’s construction and maintenance of the region. Many important buildings and construction are the live proof of the engineering skill Tamil Nadu Public Works Department. TN PWD is inviting on-line applications for appointing the Apprentice Posts. Tamil Nadu Public Works department promises to serve the people of the state better and so they are in the process of head hunting the talents in the Post of Apprentice. 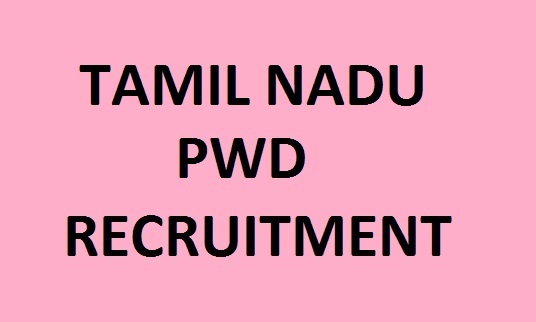 Tamil Nadu Public work Department Recruitment 2017-2018 is recruiting candidates for the following posts and one can only apply online for the required posts. Technically there are 500 posts to be filled up and the department will make sure that they will recruit all deserving talents so that they can serve the region better and keep it safe. The government of India through its official website for Government recruitment released the full project concerned with the exam vacancies. One who is eager to apply for the Sarkari job this is the best opportunity one can avail. TN PWD invites the online application forms for the post of Apprentice and the number of vacancies is 500 in number. The candidate should be Graduate Engineer or a Diploma Holder in Engineering and they should be 2015-2016 or 2016-17 pass outs. The candidates should be from Tamil Nadu. If selected the candidate has to undergo one-year training in Apprenticeship under the apprentice Act 1973. 1. In the First Category, there will be Graduate Apprentice and they will have to be a Graduate engineer in the field of Civil engineering, electrical and electronics and Electronics and Communication Engineering. This categorization is done keeping in mind the requirement in the specific department. • Electronics and Communication Engineering the requirement is only 10 posts. • Civil Engineering the requirement is for 300 positions. • Electrical and Electronics Engineering there is a requirement of only 15 positions. 2. In the second Category, PWD needs Diploma Apprentice and they will have to be a Diploma Holder in engineering or technology. In this category, the department needs 175 Apprentice. • Civil engineering Department requires 150 positions. • Electronics and Communication Engineering needs 10 posts. A Graduate engineer Apprentice has to be a Graduate Engineer of 4 years from recognized Institute or University. The degree granted to the candidates should be approved by the Act of Parliament. A Technician Diploma Apprentice should possess a Diploma in engineering or technology from State Council or Board of Technical education which is solely run by the State Government. The Diploma received by the candidate from any State Government recognized University or Institute is also acceptable. One has to enroll in NATS portal before 11th December 2017. Application can be submitted only till 12th December 2017. Log in to the URL www.mhrdnats.gov.in> click on enroll > the application form will appear for completing the form > unique enrollment number will be created for every individual students. Now when this process is over then one will have to wait for couple of days for approval and verification. The candidate has to log in with the enrollment Number given during Step 1 > establishment request menu>find establishment> then one has to upload the detailed resume> then choose the establishment name and one has to then type “Public Works Department Tamil Nadu” ( all in CAPS) and then search> Click apply> click apply again.